Shop at The Green Party and receive return vouchers for your next purchase! Receive $20 Gift Vouchers with minimum spend $30 in a single receipt. Receive $50 Gift Vouchers with minimum spend $50 in a single receipt. Vouchers are worth $5 each, not refundable or exchangeable for cash. Only 1 redemption per transaction & may not combined with other promotion, coupon and/or offer. 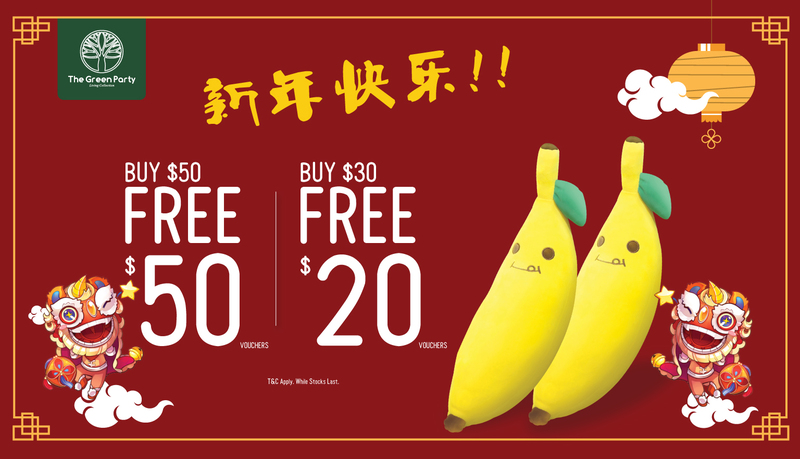 Voucher is valid on next purchase, which is to be made by 30 April 2019 with minimum spend of $30 in a single receipt. The Green Party reserve the right to vary/ amend all privileges for terms & conditions without prior notice. The Green Party is located at West Wing, #01-411. You may use our NEW Interactive Directory on your mobile phone to find your way to your favourite shop, brand or product. Visit quickguide.sunteccity.com.sg.